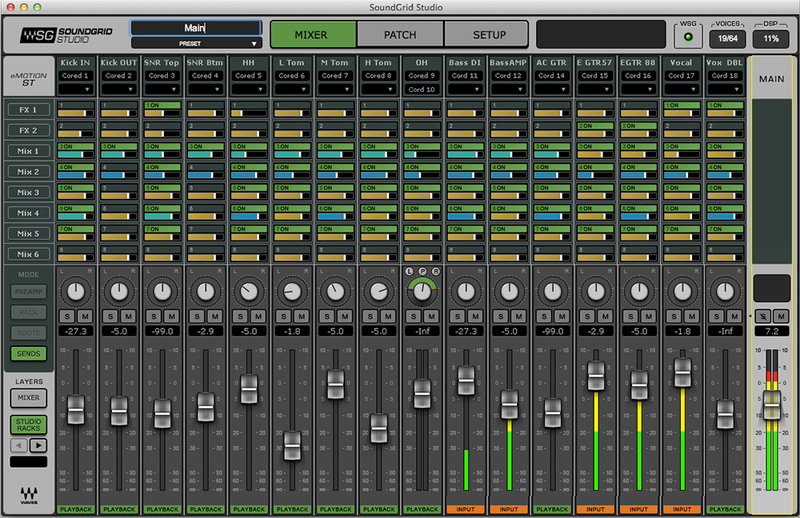 StudioRack is also available as part of SoundGrid Studio. StudioRack is a software rack designed to run plugin chains, giving you the choice of directing the processing to your computer’s CPU or to a SoundGrid DSP server. When processing your plugin chains on a SoundGrid server, StudioRack lets you monitor your tracks in low latency via the eMotion ST Mixer. Compatible with most popular hosts, StudioRack has a dedicated component for Pro Tools TDM and HDX systems, giving you access to both Avid and Waves offload capabilities. SoundGrid processing – using the HD/HDX or HD Native Avid playback engine. Local processing – using any ASIO/Core Audio driver. Host computer – For running the SoundGrid Studio application, StudioRack, and the eMotion ST mixer parallel to your DAW. Refer to the system requirements page when choosing your computer. SoundGrid-Compatible I/O – For connecting your microphones, instruments, hardware and headphones to the SoundGrid network and processing in low latency. Pro Tools HD/HDX and HD Native systems require DiGiGrid DLI or DLS I/Os to bridge Pro Tools and SoundGrid. Check the list of DiGiGrid I/Os and other SoundGrid-compatible I/Os. And/or any ASIO/Core Audio-compatible I/O – For connecting your microphones, instruments, hardware and headphones to the SoundGrid network via SoundGrid Connect. SoundGrid server – The external “number cruncher” for offloading plugin processing. Check the list of qualified servers. SoundGrid plugins – SoundGrid-compatible Waves and third-party plugins for audio processing. Waves plugins require SoundGrid or TDM licenses. For supported third-party plugins, check this list. This configuration adds the unmatched real-time processing power of SoundGrid to your system, which in conjunction with the eMotion ST mixer enables low-latency monitor mixing. In this configuration, Waves SoundGrid is set as your ASIO/Core Audio driver, and a SoundGrid-compatible I/O serves as your audio interface. 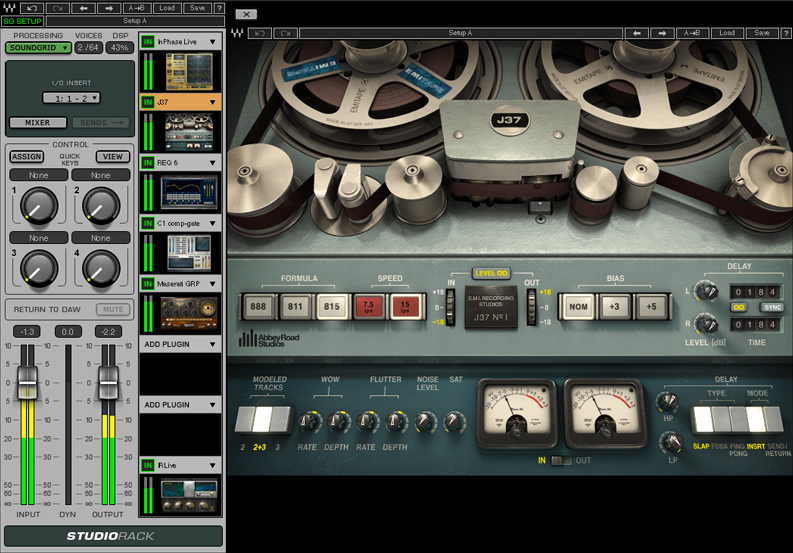 You can seamlessly add and process up to 64 mono or 32 stereo instances of StudioRack, with up to 8 plugin each. This configuration adds SoundGrid’s unrivaled processing power to your Pro Tools HD system while maintaining your existing setup features. Audio is fed to and from the StudioRack plugin through an I/O insert. This is similar to a send return to an external hardware device, but with the ability to maintain the features and functionality of all plugins on your StudioRack chains, including automation, saving, presets, etc. Since StudioRack acts as a DSP plugin, it retains the real-time abilities of Pro Tools HD and HDX systems. You can add and process up to 64 mono or 32 stereo instances of StudioRack in accordance with the number of channels available through your SoundGrid I/O. * To integrate with StudioRack, Pro Tools needs to be connected to a DLS or DLI interface via at least one DigiLink port (on your PCI card or on the expansion port of an Avid I/O). StudioRack – For running plugin chains (Native or SoundGrid license). Host Computer – Your main DAW computer for running StudioRack. Refer to the system requirements page when choosing your computer. In this configuration, all processing is done on your computer's local CPU, no matter which DAW you are using, and no matter whether or not you are using a SoundGrid I/O and DSP server. Even if you are using a SoundGrid Studio driver, some other ASIO/Core Audio driver, or even your HDX system as your driver, you will always have access to StudioRack’s local processing mode. When you process multiple StudioRacks, you can choose to direct the processing of some StudioRacks to your host computer's CPU and of others to a SoundGrid DSP server, as best meets your needs. This is done using the processing mode switch. Choosing to direct StudioRack processing to a SoundGrid DSP server enables you to use hundreds of plugins simultaneously. Whether processing on your local CPU or on a SoundGrid server, you can use the same plugin chain presets for recording, monitoring and mixing. Whether your session was created with or without SoundGrid processing, instances of StudioRack will load automatically, letting you use the same plugins and settings saved in your session. When you import a session created on a SoundGrid system to a non-SoundGrid system, StudioRack will switch seamlessly and automatically from SoundGrid processing to local CPU processing without losing your workflow and will let you use the same plugin chain presets. Working with StudioRack along with a SoundGrid DSP server and the eMotion ST mixer enables you to record and monitor at super-low latency while using plugins. When you are done tracking, the same plugins you have just used while monitoring are instantly available on your DAW with the same settings for mixing. In the SoundGrid server configuration, your system uses the Waves SoundGrid ASIO/Core Audio driver for plugin processing. StudioRack appears on your DAW, but its processing takes place on the SoundGrid DSP server. When the StudioRack monitor status switches to Input, StudioRack receives its feed directly from the connected I/O, bypassing the DAW and its buffering latency and thus creating a low-latency path. This process does not affect the recording of the input signal into your DAW. StudioRack’s output appears in the StudioRack layer of the eMotion ST mixer. This gives you control over the levels and panning of each StudioRack. It also gives you the freedom to create multiple personal monitor mixes per individual channel directly from StudioRack. Presets: Create. Save. Share. Transfer. All factory and user presets for individual plugins are accessible through StudioRack. Plugin chain presets of up to 8 plugins each can be saved and loaded. Plugin chain presets are accessible on any DAW via StudioRack. Plugin chain presets can be shared between StudioRack, MultiRack and the eMotion ST mixer. Quick Keys – Quick access for controlling different plugin parameters within your chains whether the plugin's window is visible or not. MIDI Learn – Control any parameter on all Waves plugins within your chain. Avid Control Surface Support – Includes automatic mapping for D-Command master section (EQ and dynamics). A SoundGrid network is completely scalable, so this basic configuration can grow. SoundGrid is compatible with most popular DAWs and combinations of different DAWs, as well as with Pro Tools HD/HDX and HD Native systems. By adding a DSP server, you can offload plugin processing from your DAW. This enables you to use the eMotion ST mixer and StudioRack plugins, as well as additional plugins, and record and monitor with very low latency. By using a DiGiGrid IOS with its built-in SoundGrid DSP server, you can offload audio processing from the DAW. This affords much more processing power (up to 8 plugins per StudioRack insert). 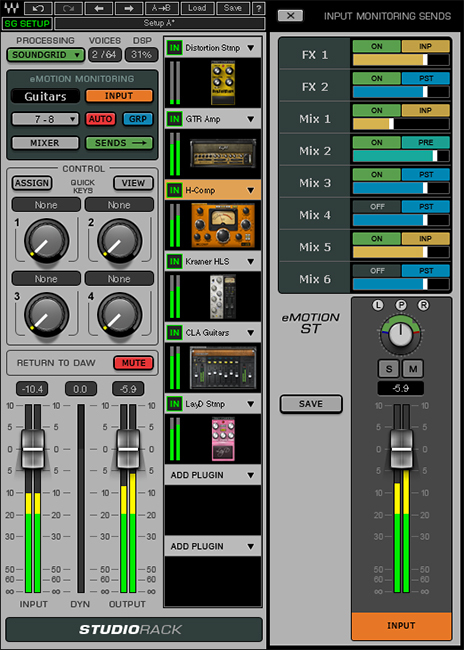 Plus, you can use StudioRack in conjunction with the eMotion ST mixer. This enables you to record and monitor with very low latency and increases the number of plugins you can use simultaneously. You can also use the eMotion ST mixer without StudioRack and record your sources processed with plugins (inserted directly on the eMotion ST) to your DAW. The eMotion ST mixer also lets you control the input and monitoring of your DAW and of external devices connected to the SoundGrid system, such as media players and phones. You may have a Pro Tools HDX system and want to take advantage of the extra power of a SoundGrid network, with real-time plugins processing and access to multiple I/O devices across the network. This setup allows you to use up to 48 StudioRack mono instances, with up to 8 plugins per StudioRack insert. StudioRack instances employing local CPU can still be used as well. In this configuration, a DiGiGrid DLS with a built-in server is the bridge connecting your Avid devices to the SoundGrid network. Avid hardware is used for I/O and A/D/A conversion, while processing takes place on the server. This setup allows the use of up to 64 StudioRack mono instances. By using a DiGiGrid DLS with its built-in SoundGrid DSP server, you can offload audio processing from the DAW. This affords much more processing power (up to 8 plugins per StudioRack insert). Plus, you can use StudioRack in conjunction with the eMotion ST mixer. This enables you to record and monitor with very low latency and increases the number of plugins you can use simultaneously. StudioRack instances employing local CPU can still be used as well.